Rotherham boss Neil Redfearn won on his return to former club Leeds as his struggling side took three precious points from a game both teams finished with 10 men. Joe Newell gave the visitors the lead when he headed home in the 54th minute. Home defender Gaetano Berardi and Millers debutant Leon Best were then sent off after a fracas. Leeds pushed hard for an equaliser but Rotherham held out for their first win under Redfearn. The Millers made nine changes to the team that had lost 5-2 to Ipswich last time out as Redfearn, who was sacked by Leeds in the summer, gave debuts to striker Best and full-back Stephen Kelly. It seemed to have had the desired effect as the visitors started well, but they were indebted to keeper Lee Camp as he got across his goal well to deny Alex Mowatt the opener. Leeds, managed by former Millers boss Steve Evans, nearly took the lead immediately after the break when Mirco Antenucci thumped a shot just off target. 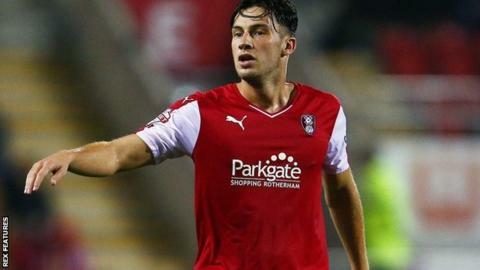 Rotherham went in front when an unmarked Newell headed home from Richie Smallwood's cross. Antenucci had a great chance to level for the hosts from 10 yards but he dragged his effort wide before Lee Frecklington came close to doubling the away side's lead when his header went just over. The game took a dramatic turn when referee Keith Stroud showed red cards to Best and Berardi after an altercation near the halfway line in the 72nd minute. Leeds threw everything at the Millers in the final minutes but Chris Wood directed his header straight at Camp and Jordan Botaka shot wastefully wide as Rotherham moved off the bottom of the table. "I don't think we lacked application or effort, it looked like we lacked quality around the box. We are not going to hide behind a performance that was down from the last two games. "It hurts, you take it twice as hard. I always take defeats hard so to take defeat against a team I have great pride in leaving does hurt more. "Neil has got his first win, we will congratulate them, I hope they win some games but I feel we contributed to their success today. I am very low, I will be low for a couple of days." "This is sweet, it has been tough. Leeds fans will probably be as happy as Rotherham fans tonight. "It was a real battling performance and I thought we wanted it more than Leeds today. "When it mattered we wanted it more than them and that was apparent." Match ends, Leeds United 0, Rotherham United 1. Second Half ends, Leeds United 0, Rotherham United 1. Corner, Rotherham United. Conceded by Marco Silvestri. Attempt saved. Grant Ward (Rotherham United) right footed shot from the right side of the box is saved in the bottom left corner. Assisted by Danny Ward. Attempt blocked. Lee Erwin (Leeds United) right footed shot from the centre of the box is blocked. Assisted by Jordan Botaka. Attempt blocked. Jordan Botaka (Leeds United) left footed shot from the centre of the box is blocked. Assisted by Alex Mowatt. Lee Erwin (Leeds United) wins a free kick on the left wing. Attempt saved. Chris Wood (Leeds United) header from the right side of the six yard box is saved in the centre of the goal. Assisted by Mirco Antenucci. Substitution, Rotherham United. Danny Collins replaces Joe Newell. Attempt missed. Jordan Botaka (Leeds United) right footed shot from the right side of the box misses to the left. Assisted by Tom Adeyemi. Lee Frecklington (Rotherham United) wins a free kick on the right wing. Substitution, Leeds United. Lee Erwin replaces Lewis Cook. Substitution, Rotherham United. Danny Ward replaces Jonson Clarke-Harris. Attempt missed. Giuseppe Bellusci (Leeds United) right footed shot from outside the box is high and wide to the left from a direct free kick. Joe Newell (Rotherham United) is shown the yellow card for a bad foul. Attempt missed. Lewis Cook (Leeds United) right footed shot from outside the box is high and wide to the right. Leon Best (Rotherham United) is shown the red card for violent conduct. Attempt missed. Lee Frecklington (Rotherham United) header from the centre of the box is too high following a corner. Corner, Rotherham United. Conceded by Giuseppe Bellusci. Substitution, Leeds United. Jordan Botaka replaces Stuart Dallas. Substitution, Leeds United. Tom Adeyemi replaces Luke Murphy. Attempt missed. Mirco Antenucci (Leeds United) right footed shot from the centre of the box misses to the left. Assisted by Chris Wood with a headed pass.